By the time you read this, Christmas will have come and gone. I hope that you had a blessed holiday season with family and/or friends. 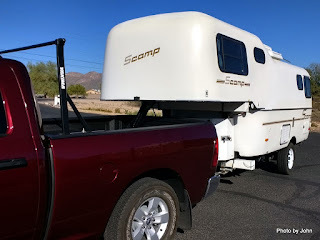 I suppose I could have done the Los Algodones trip as a one day, out & back trip but it seemed like a wonderful excuse to put some miles on the new truck towing the Scamp. 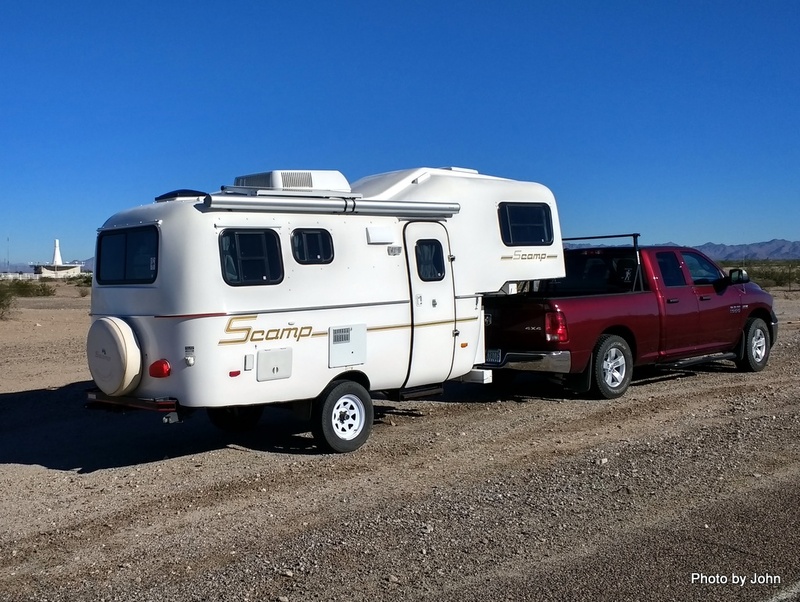 It was about 240 miles from our house to the Sidewinder Road boondocking area north of Interstate 8 in Southeastern California. On the trip, I made no effort to conserve. I wanted to see what sort of temps I would see when the truck was working. Not only did I run at 65 mph, I was dealing with a 15 to 20 mph headwind. Even with the headwind, the temps were very comparable to what I've observed when driving without the trailer. Because of the extra headwind, the truck ran most of the trip in 7th gear. On the way back, I have very little headwind, but no tailwind. The truck ran the vast majority of the trip in 8th gear with temps very similar to what I observed on the westbound trip. I still haven't pulled the trailer on significant, long grades, but I was very pleased to see how it did with the hill east of Yuma. It pulled the hill at speed with no change in temperatures. All in all, I'm very pleased. It would be nice to have more useful load. 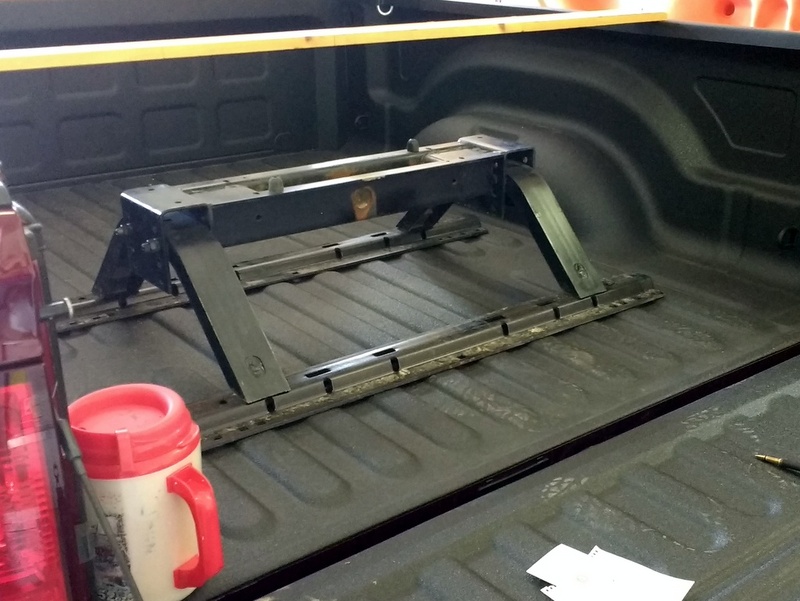 With the hitch and all my additional options in place, full (32 gallons) fuel and me, we have 1000 pounds left for tongue weight and extra bodies. Not a lot, but adequate for us. We're WAY under the combined gross weight rating, and comfortably under both front and rear axle ratings. 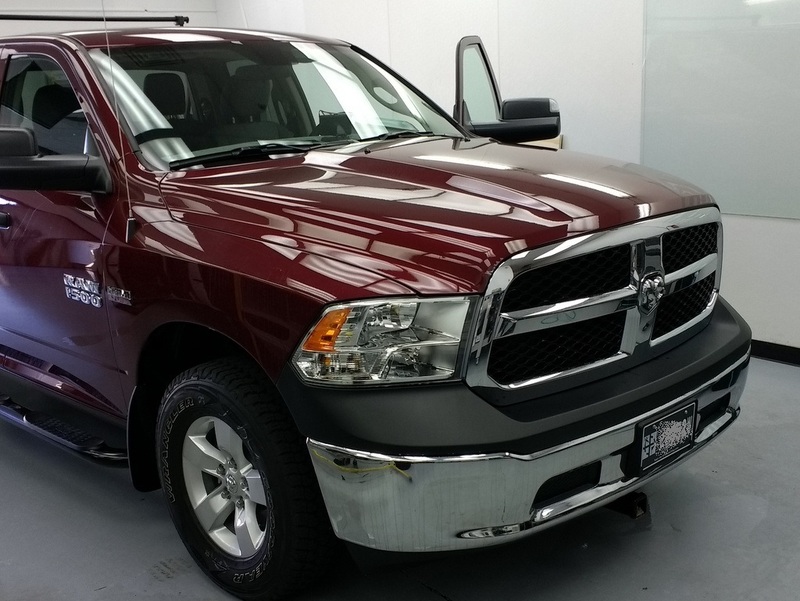 The 5.7 liter Hemi engine has lots of power and torque. The truck's traction control software keeps it from being a tire burner which is both good and sometimes a bit disappointing. It's not a neck snapping drag racer! Even in tow/haul mode, the shifts are notably softer than the old Tacoma transmission but it does a wonderful job of picking an appropriate gear without building excess heat in the transmission. 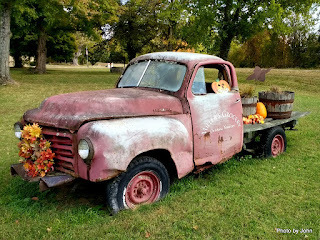 I'm of the opinion that the 8HP70 transmission is the best feature of the truck. 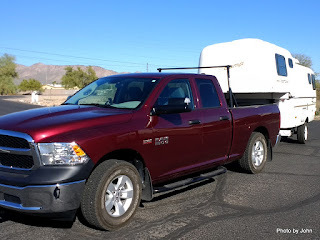 We took a towing mileage hit of about 10% compared to the Tacoma, it seems, but it's a much more relaxed experience. 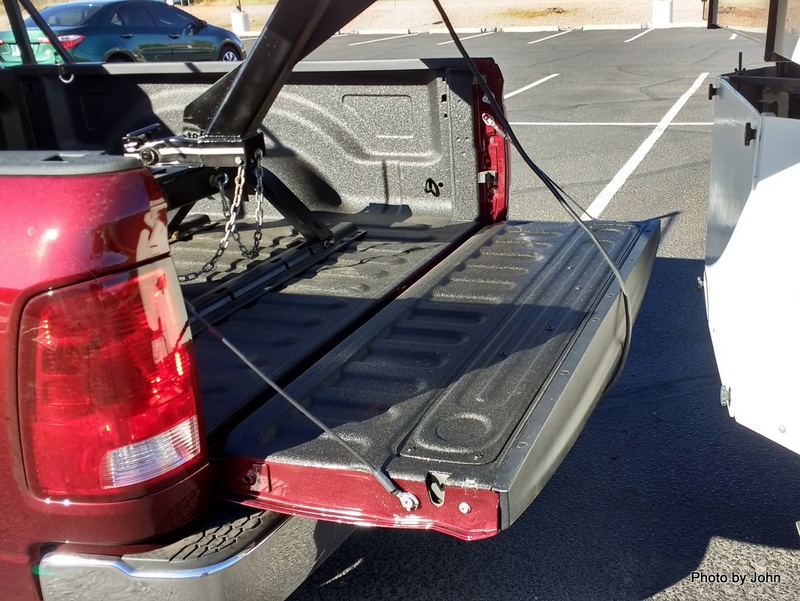 Meanwhile, the optional 32 gallon tank gives me just about twice the towing range of the Tacoma. I went with the 3.92 gear ratio in order to get the maximum certified trailer towing weight. I certainly didn't need that for the Scamp and it may be overkill but I wouldn't know without towing with the stock 3.21 or optional 3.55 ratios. Similarly, the 3.6 liter gas V6 engine may have been adequate (and lighter) but the Hemi doesn't break a sweat. I seriously considered the 3.0 diesel engine but took it off my list because of the 300 pounds of extra weight. Now, I'm glad I did. They still haven't started delivering the 2017 EcoDiesel trucks - some hangup in the EPA certification. I picked it because of the physical fit, but it turned out to be much more. It's a keeper! Would You Do It Just Because Your Friends Do? In this case, the simple answer was yes! 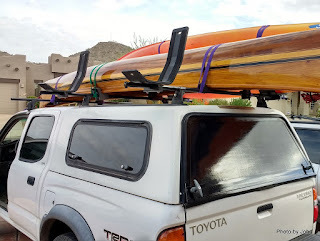 My morning started with the short line to get into the Quechan parking lot on the California side of the border, just west of the Colorado River. Los Algodones is one of those border towns that are built around specific industries. 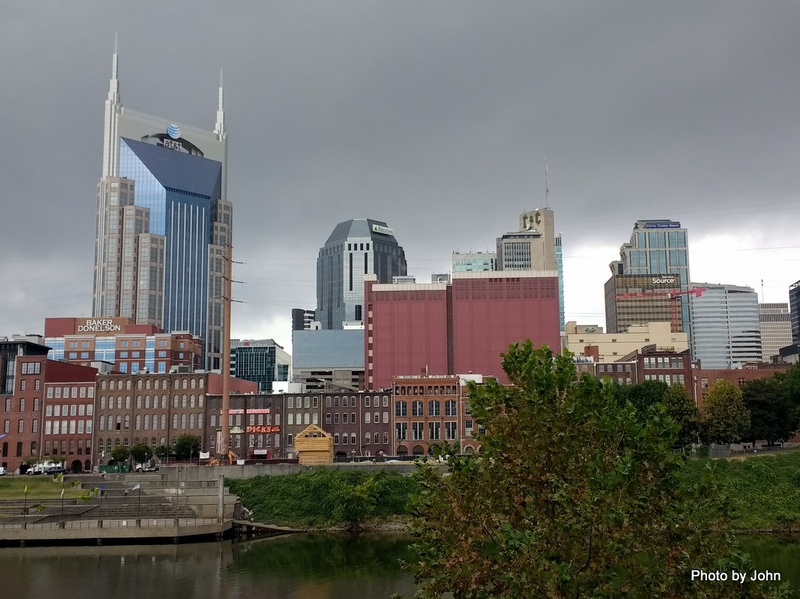 This town exists primarily to provide optical, dental, and pharmaceutical services, primarily to Americans walking across the border for the day. There are lots of tall fences to get people headed the right direction. The primary purpose of the fences is to herd the northbound pedestrians and traffic to the appropriate Customs & Immigration staff. As a southbound pedestrian, you pass through a gate in the fence but there's no one to check your paperwork. Easy peasy. If you didn't know about the primary businesses in town before you crossed the border, it becomes immediately apparent. There's no reason to not know, given the number of billboards on Interstate 8 advertising Los Algodones services. The real reason for this picture is the power lines. Abundant overhead lines is one of the obvious signs that you've crossed the border. Everywhere you turn are signs advertising services - primarily Los Algodones' big three. Some of the signs make it clear that some dentists purport to be experts at everything. It didn't take long to find the sign I wanted. Dr. Maria Fonseca had been recommended by friends and friends of friends. 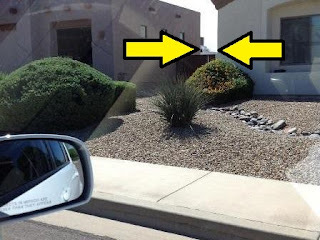 I also looked into another dentist in a nearby town that was recommended, but that dentist didn't respond to an e-mail query while Dr. Fonseca did. Her office was clean and modern and all of her staff spoke English which made everything easy. She had both English speaking and Spanish speaking patients in the office while I was there. My local dentist had recommended an extraction, bone graft, and then a bridge. The only problem was that the price they wanted did not include a deed to the Brooklyn bridge, but should have given their prices. The before picture. Dr. Fonseca (right) and the bone graft specialist that she called in, had me in the chair on schedule, and back across the border within the hour. I was very impressed with the level of care and all my dealings. I'll be back in a couple months for the bridge building. I finally got the Scamp hitched to the truck to see how things fit. I knew I'd need a relatively level, empty parking lot to get some measurements which was an illogical thought for Black Friday. 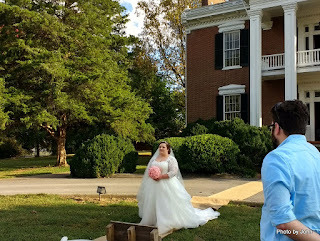 The Baptist Church down the road had a reasonably level spot in their lot so that's where I went. The truck settled about 2.5 inches with the 700 pound tongue load. 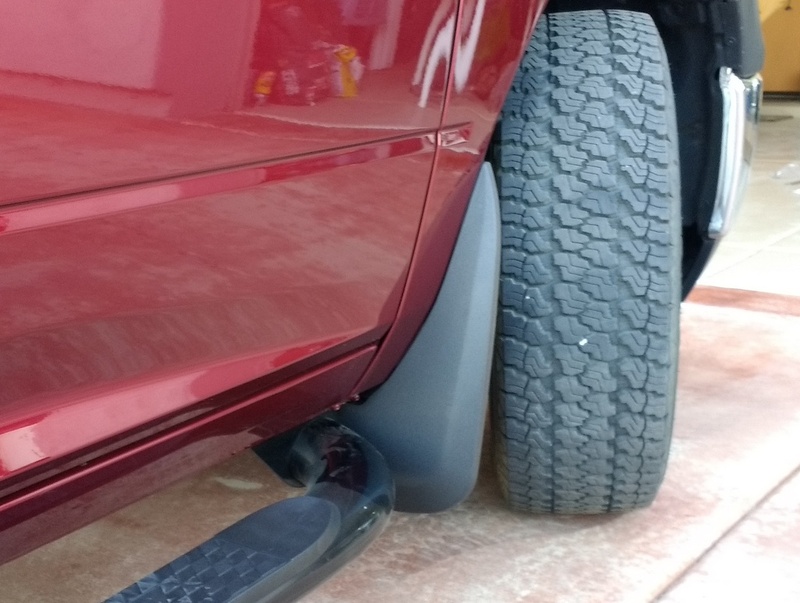 I was expecting 7 inches of bed rail clearance but ended up with 8.5 inches. I'm real pleased. When I started shopping I was working with a 6 inch minimum in my mind - really nice to have that extra 2.5 inches. I set the hitch further back from the normal position for a fifth wheel hitch, but wasn't worried about that since the tongue load is less than the tongue load limit for a standard trailer with this truck. 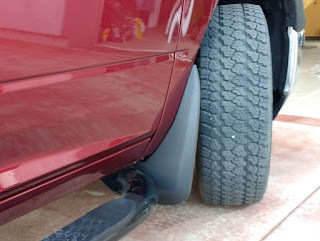 I've still got plenty of clearance between the tongue and the closed tailgate. The mod of the 15K Reese hitch was super easy. Just pulled the pin that held the original fifth wheel and replaced it with a piece of 3/8" steel bolted to the structure using existing holes. 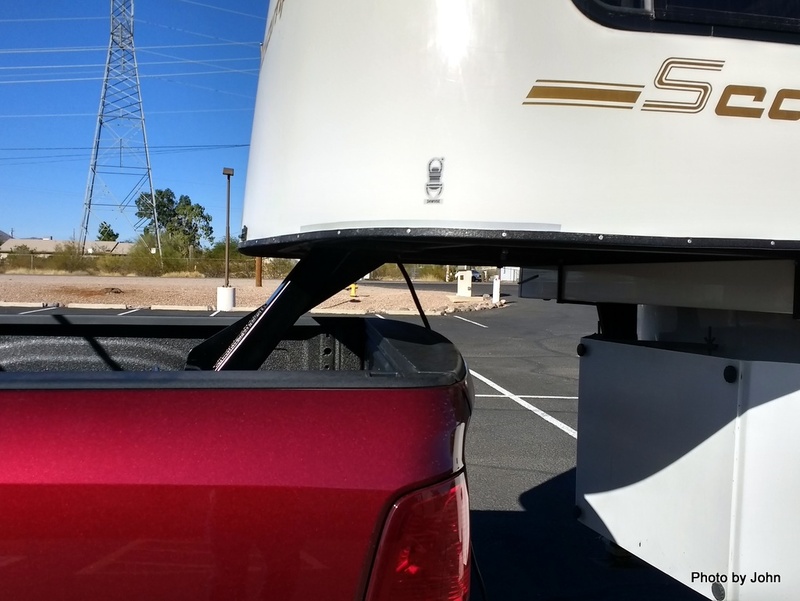 By mounting the hitch further back, we have tailgate clearance. Should have 1/2 inch or so even when the truck is at 45 degrees to the trailer. I'm super please with how it's all fitting together. 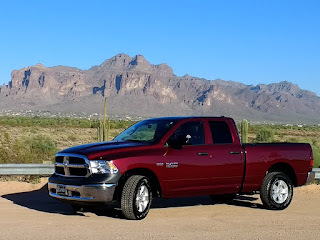 I drove it a few miles and like the way the truck pulls, the transmission shifts, and the temps I was seeing. The next big test will be a quick trip to Yuma. Time to go visit a Mexican dentist. 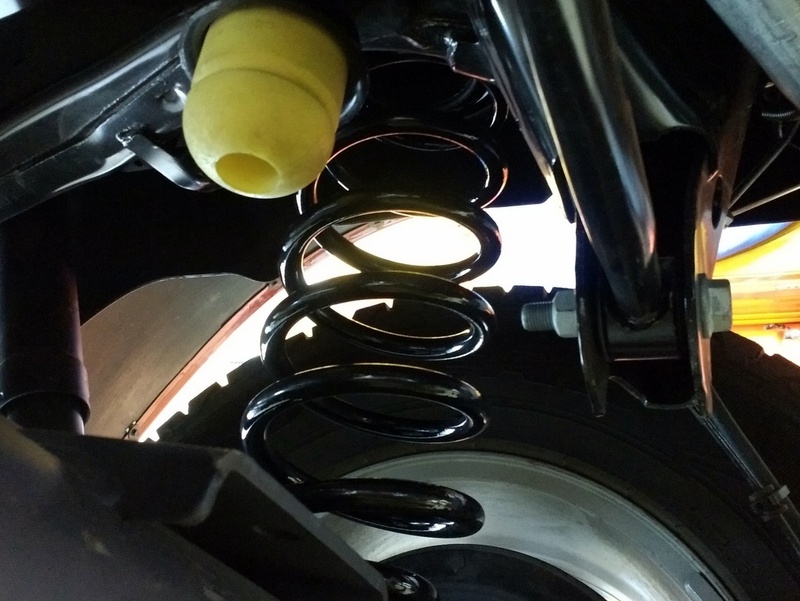 In September of 2014 we put shocks on the trailer. They made a big difference in the ride - I was an immediate fan. 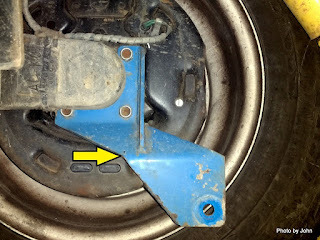 Last summer, the left side shock mount failed when we were in Cheyenne on our way home. 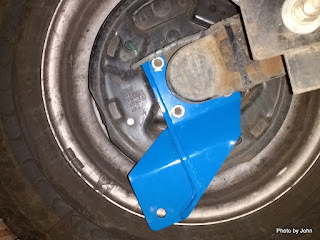 I called Orbital Machine Works and they sent out a new pair of lower brackets of an improved design. It's a poor picture and a misleading angle, but you get the idea. 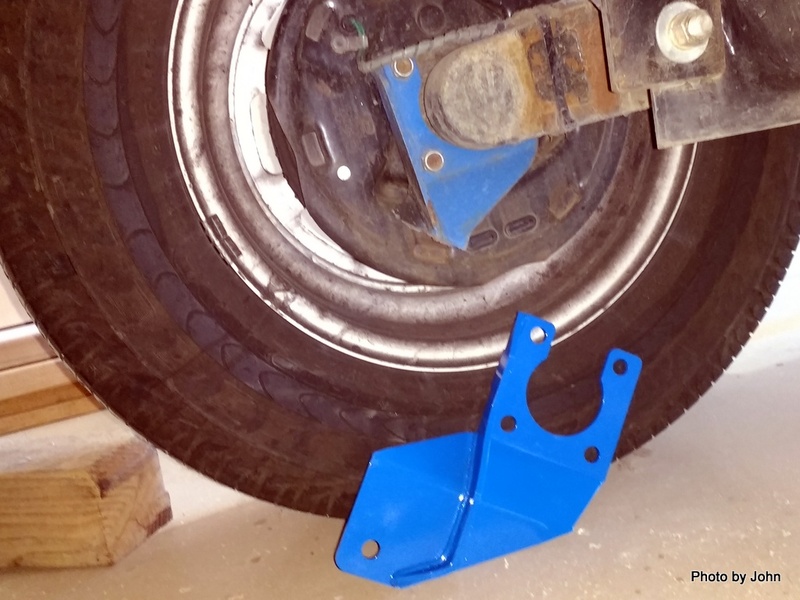 The new mount is shaped differently and has a one piece welded flange that extends the length of the bracket. Much stronger design! It mounts to the wheel using the brake backing plate studs and furnished all-metal locking nuts. Very nice! 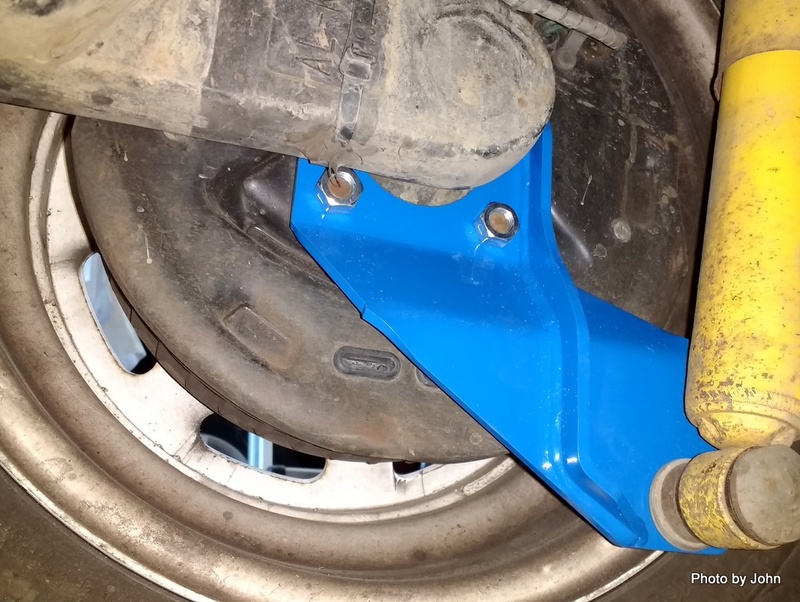 On the other side, I unbolted the lower shock bolt and swung the shock out of the way so I could change the bracket. Good thing I changed both sides - this one was just starting to develop a crack in the same place, right at the tip of the arrow. Right side installation complete. I'm real glad to have the left side fixed and the right side updated before it also failed. 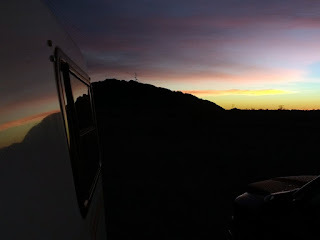 I can't say enough good stuff about the folks at Orbital Machine/Perfect Casita. 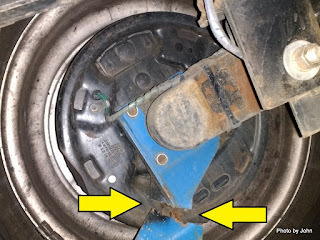 They replaced the shock brackets without question. I was super surprised to see the original break, but the updated bracket is clearly a stronger design. 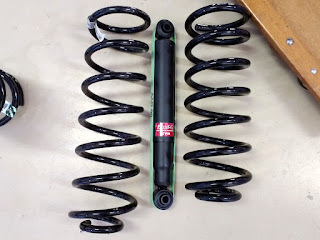 I'm looking forward to testing it this summer. 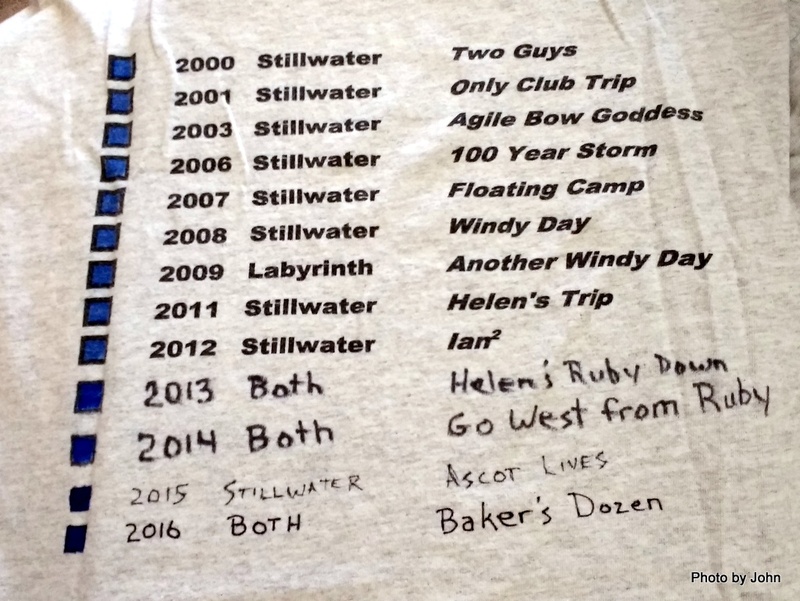 The other outstanding issue we experienced on our summer trip was a crack along the weld at the base of the gusset. 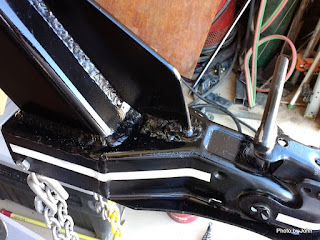 I cut and shaped a piece of 1/4" material that could go under the gusset and bridge to the sides of the hitch but I didn't have tooling to make the complete cut of the gusset so instead the old bead was ground out and rewelded. We'll keep an eye on it. 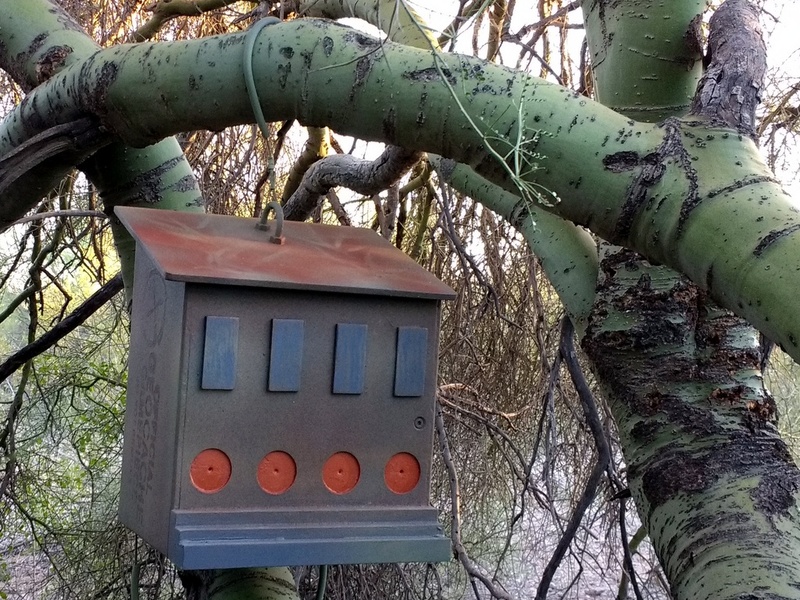 I really enjoy building unique geocaches but I'm always looking for new ideas. 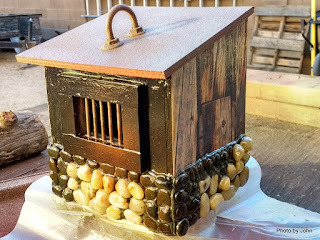 We decided to host a cache building workshop in the hopes that we would pick up some new techniques, or ideas. 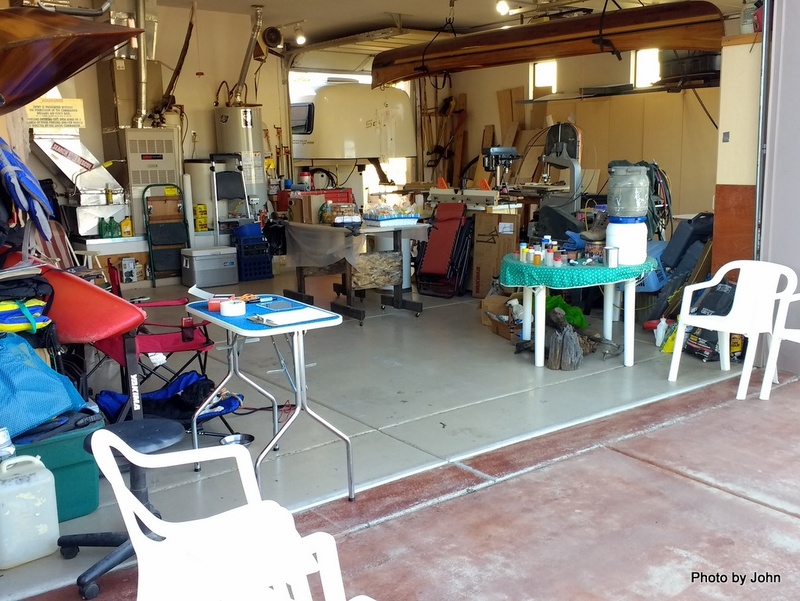 It was a bit tough clearing space in the garage, but we figured we could handle about 30 people teaming up in a cache building contest. The event didn't turn out quite the way I'd expected. While there was lots of cache building materials available, no caches were built. Everyone stood around drinking coffee and chatting. Some were looking at caches that others brought with a few light bulbs going off as people figured how they could adapt concepts to their own builds. As much as I tried to get people to get hands-on, chatting was the order of the day. 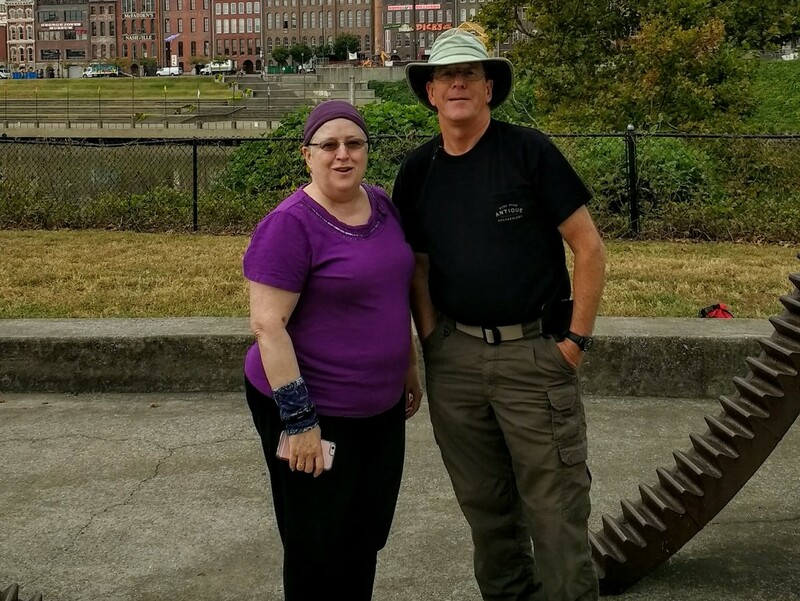 For many, this event drew a different crowd of geocachers, resulting in lots of first time meetings. Conversation flowed easily and folks commented how much fun they had even though the event that happened wasn't the one I'd conceived. One of the conversations mentioned 'jail' which got my mind going a whole different direction. 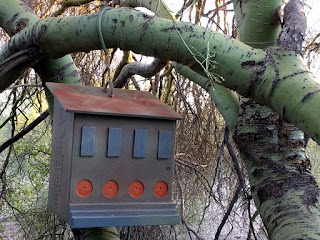 This one isn't a cache, but rather it will serve as the first way-point for a multi-cache. Cachers will need to figure out their next coordinates from careful reading of the cache description and examination of this structure. The next one may be a more complex jail themed structure. I must say, I've been enjoying this very lazy approach to blogging. I thought about stopping entirely, but I use the blog to mark other blogs I regularly read, and I couldn't stand seeing my content sitting there static. It won't be updated as often as it was the first few years, but it will continue to primarily reflect travel, Scamp mods, and geocaching. For the first time in years, we ended up with all the siblings in one place. 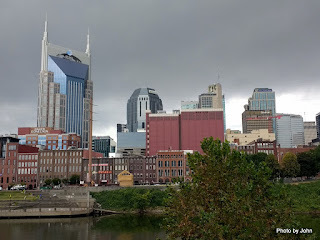 My sister and I both headed to Nashville early in the week which gave us time to wander around town and to teach her about geocaching. 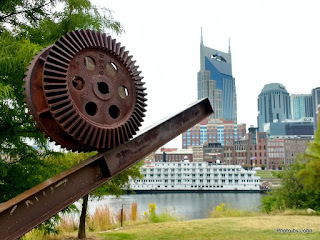 We found a series of public art pieces along the river that made for an interesting view of downtown Nashville and the Batman (AT&T) building. 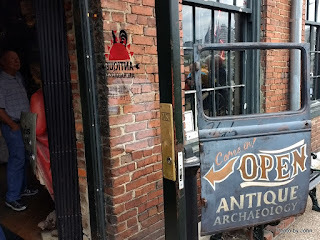 I couldn't go to Nashville and not visit the Antique Archaeology store. 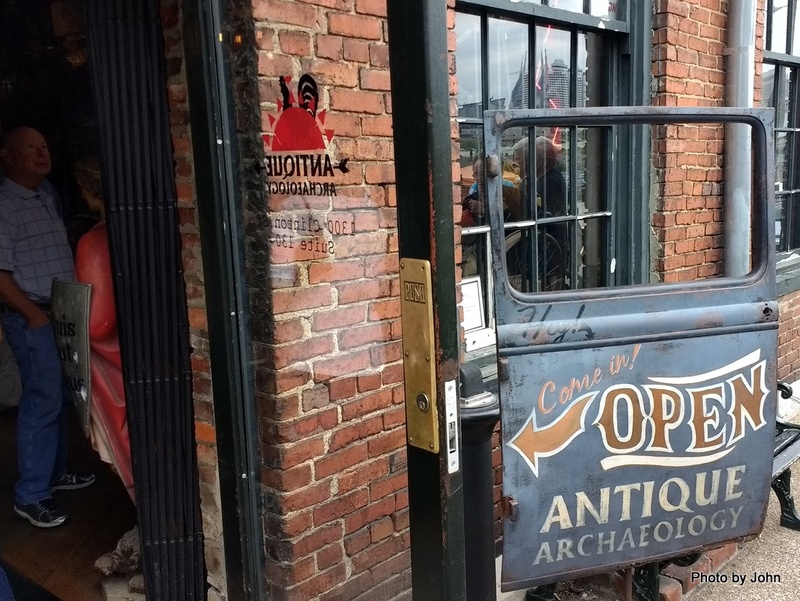 I love the History Channel's American Pickers TV show and wanted to see their store. I recognized some pieces that had been featured on the show, but was very surprised by the small space. Loved seeing the creative re-use of the old Marathon auto factory. The Tennessee branch of the family took us out to Millers Grocery in Christiana for lunch. Of course, I had to check out their home delivery vehicle. 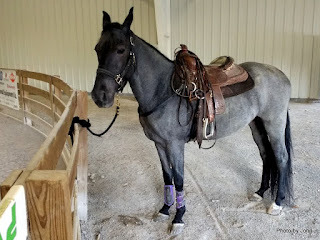 You can't go to Tennessee and not check out Tennessee Walking Horses, especially not when the family is breeding them. But the real reason I went to Tennessee was to celebrate my youngest niece's wedding. 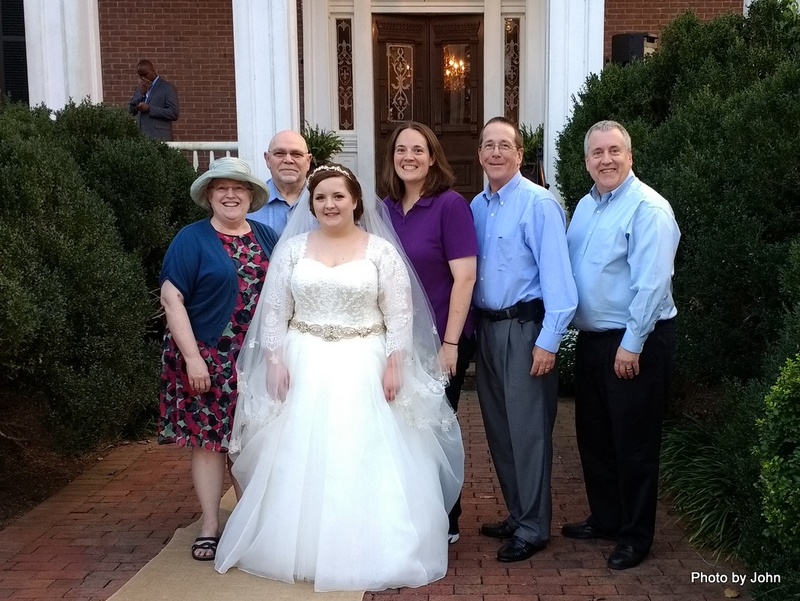 Got a picture of some of the West Coast family with some of the Tennessee sisters. Great fun with family. It's been over six weeks since I last updated the blog. There's been a lot of water under the bridge since then. The Tacoma, which served us well for 15 years and 280,000 miles has a new home. 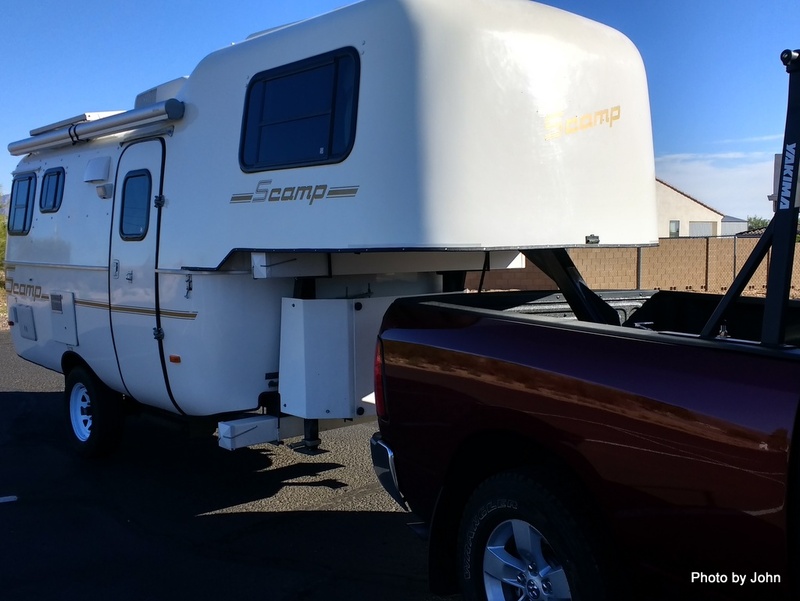 It was tough choosing a replacement, with the primary consideration being how it will fit with the Scamp. In the end, I chose a Ram 1500. Payload is fairly similar, but the torque is twice as much and towing range will be nearly double. 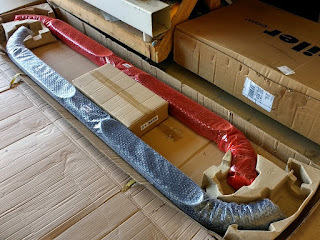 To get it optioned the way I wanted it, we ended up ordering it from the factory. 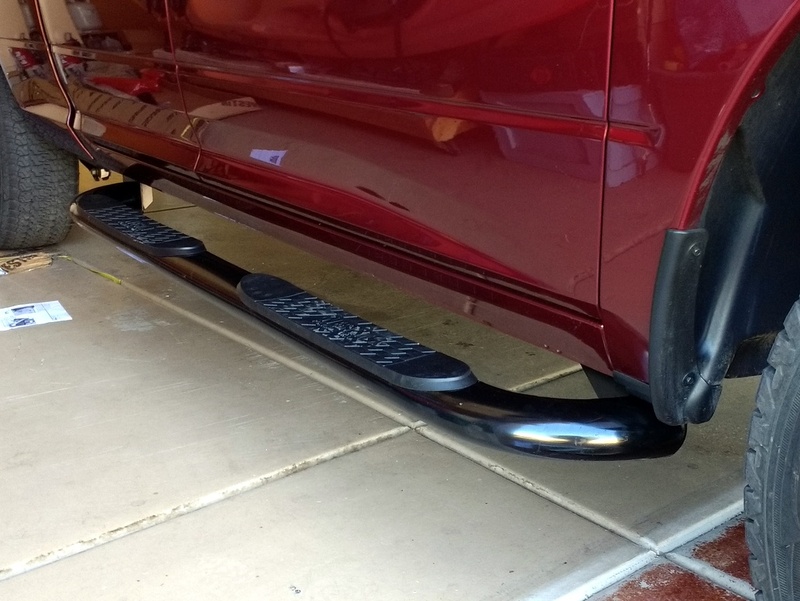 I ordered the Westin side steps and the Draw-Tite front receiver from eTrailer. Could have ordered steps from Ram, but I'm a cheap skate. In both cases, they bolted on with little extra effort. 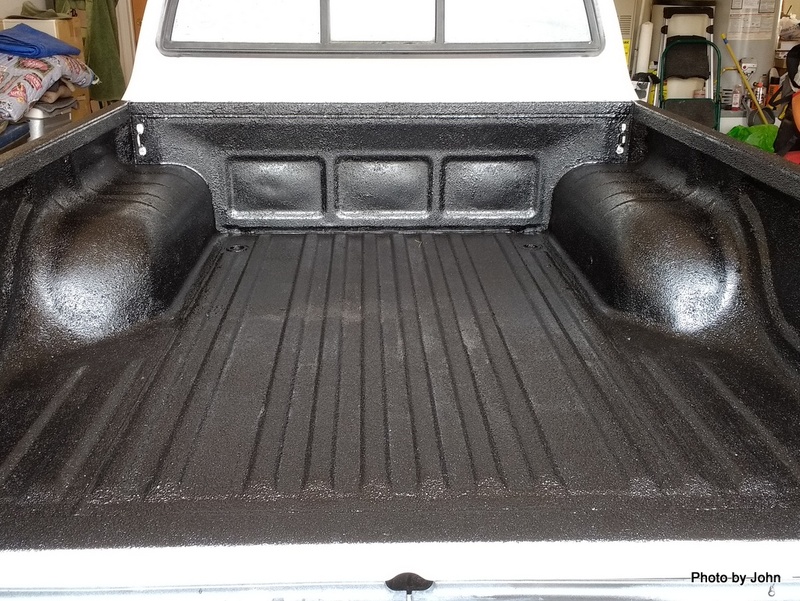 The side steps leveraged existing frame holes and bolted in place very quickly. The front hitch receiver (that we'll use for supporting the canoe when we haul the canoe and the trailer at the same time) was a bit more effort since it required drilling a couple holes in the frame. The nice carpet floor mats were removed and replaced with a full set of Husky Weatherbeater mats. 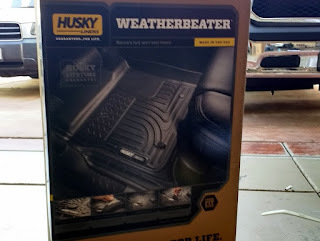 I also got mud flaps for all four corners from Husky. 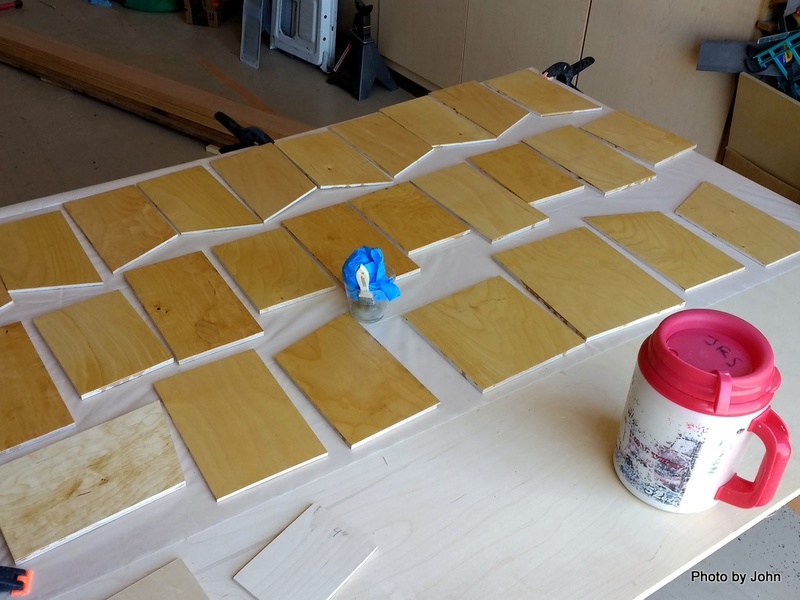 These were a very quick install with just a couple small holes to be drilled. Perhaps the most important reason for selecting the Ram was that there were aftermarket springs available that would lower the back end about 1.5 inches, improving the clearance between the top of the pickup bed and the loft on the trailer. 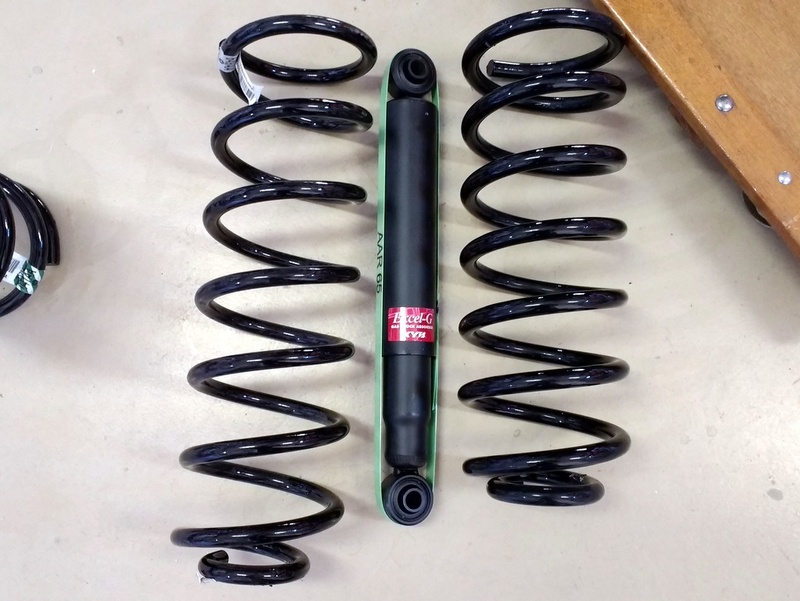 The TufTruck TTC1210L spring kit included the shorter (but thicker) springs and slightly shorter KYB shocks. I was concerned with this project, but it turns out the toughest thing was accessing the upper shock retaining bolts. I'm real pleased with the change in stance while retaining a good ride. 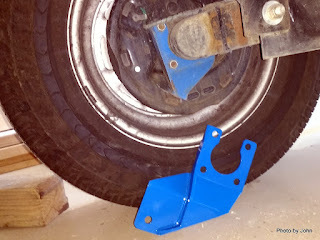 The project I was avoiding was the installation of the hitch for the Scamp. I leveraged the tracks and base of a used Reese 15K hitch. 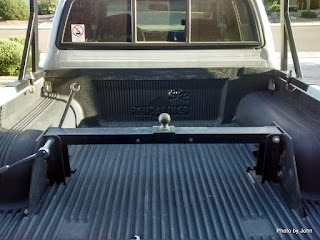 I knew I wanted to install it in a 'non-standard' position so that there would be clearance for the tailgate. 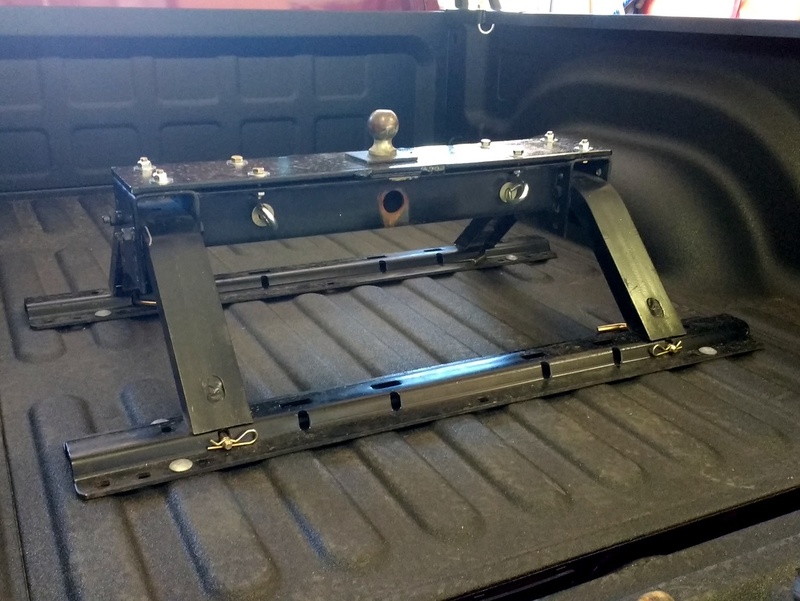 Turns out I was able to leverage some of the pickup bed frame attach points so the project was easier than I anticipated. Now the hitch can be removed simply by pulling four pins, leaving just the tracks in place. I fitted a Yakima Outdoorsman rack at the front of the pickup bed, and matched it up with one Yakima cross-bar that clamps on above the front doors for hauling boats. The last step was to install clear paint protection film on the forward 18" of the hood and fenders as well as the headlights. One of these days soon, we'll drag the Scamp out and see if all the measurements were correct! After providing faithful service for 15 years, my Tacoma is being replaced by something new and shiny. 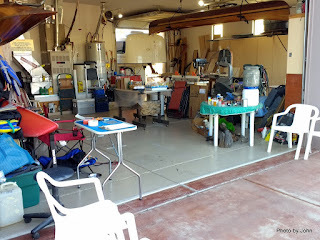 It dawned on me that I could get my shop space back by pushing the Scamp through the garage and parking it behind the 3rd bay for a few months while I deal with prepping the Taco for sale, installing a hitch in the new truck when it comes, and finishing some cabinet projects that have been on hold for six years or more. 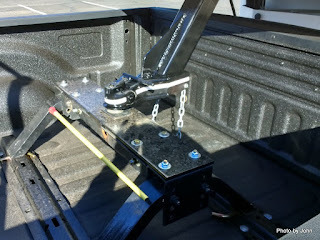 I was able to pick up a Reese 15K fifth wheel hitch that will form the basis of the hitch for the new truck. 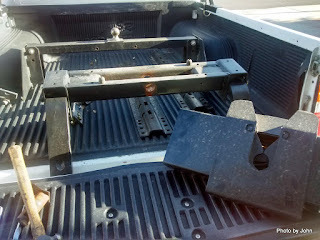 With that out of the way, it was time to remove the Scamp built hitch and the modified bed liner from the Taco. 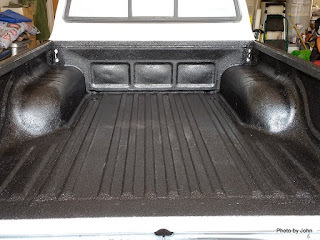 so that I could apply a couple coats of Herculiner. Looks much better than it did. 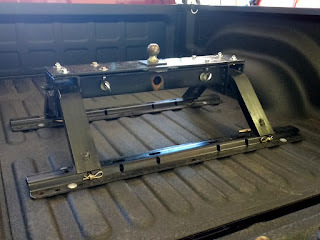 With the Taco hitch out, and the original canopy back on the truck, I had a bit of time to build some birdcage caches, or so I thought. I got the birdcages finished up and hung out for the benefit of local geocachers. This one is called Rent Control. 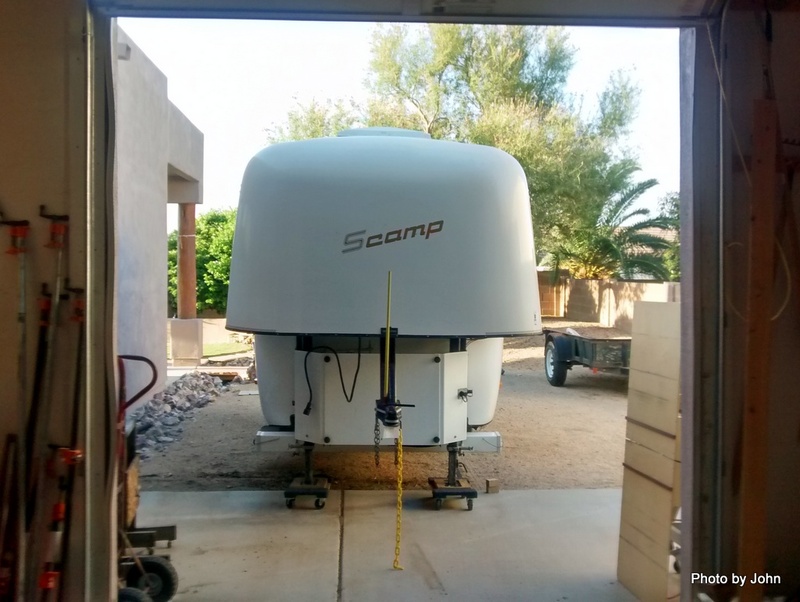 At least the HOA nasty-gram arrived quickly enough that we had time to put the trailer back in the garage before we head out for our 13th Green River trip. 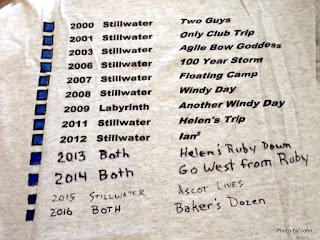 Looks like it's nearly time to do a new tee-shirt. Two of the three boats are loaded and I'll pick up Kathy's boat tonight. We'll hit the road at o'dark thirty in the morning. 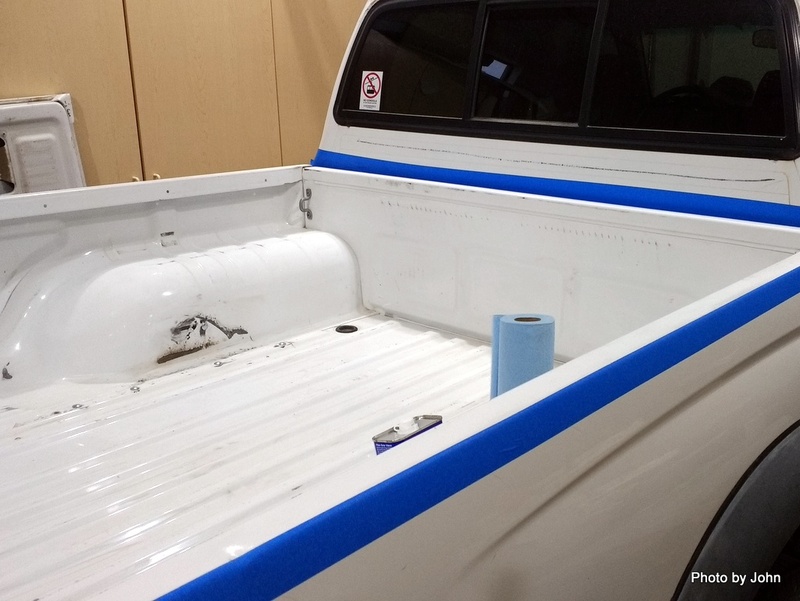 Meanwhile, if FCA's plans are on track, the new truck is supposed to be built today.